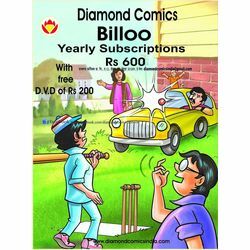 Billoo is a popular Indian comic character created by Pran Kumar Sharma. It is published by Diamond Comics. The character was created in 1973. Much like the American comic book character Archie, Billoo is fun loving, likeable by girls although not so "Casanova friendly" as Archie is and loves to play cricket. No one has ever seen Billoo''s eyes due to hair covering it and his forehead. Billoo has a pet pup called Moti. His gang includes Gabdu, Jozi, Monu, Bishamber among others. His bte noire is Bajarangi, a wrestler and Dhakkan, Bajarangi''s aide. Jozi''s dad Colonel Three Naught Three also dislikes Billoo. In 1973, cartoonist Pran was looking for a school going teenage boy who could feature in the comic strips. Thus he created a boy with a long hair covering his eyes and named him BILLOO. This lanky was liked by the readers so much that the editor of the magazine asked the cartoonist to increase the episodes from one page to two. Billoo is seen roaming the streets with his pet pup - Moti. When he is at home, he is stuck to the TV. Billoo and his gang which includes Gabdu, Jozi, Mono, Bishamber etc. ; are at loggerheads with Bajarangi, the wrestler and his aide Dhakkan. They are always in search of some excuse to showdown each other. Jozi is friendly to Billoo, but her dad Colonel Three - not - Three does not like the boy and always points his gun at him.